The truck came with a rear chrome bumper, but it had a couple bad dents that would be difficult to straighten, and it would need to be re-chromed. 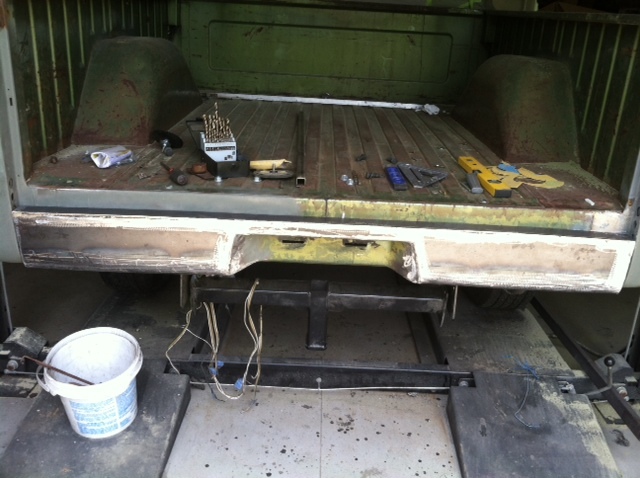 I fabricated a front winch bumper for the truck and now it was time to do something on the back. I thought about fabricating more of a bulky 4X4 type bumper but my son said I should consider a roll pan for a nice clean look. I’ve seen lots of roll pans on trucks but never considered it on the power wagon. After giving it some thought I made the decision to to try fabricating the roll pan. The first thing I did was cut the old license plate section out so I could use it in the new roll pan. Once that was done there was no turning back, so I found a piece of good heavy gauge metal in the shop and cut it to the length and width I wanted. I left a little extra on the width since it would need to be heated and shaped to match the contour and rear bed corner lines. Next I cut a section out for the license plate holder and tacked the old piece in place. 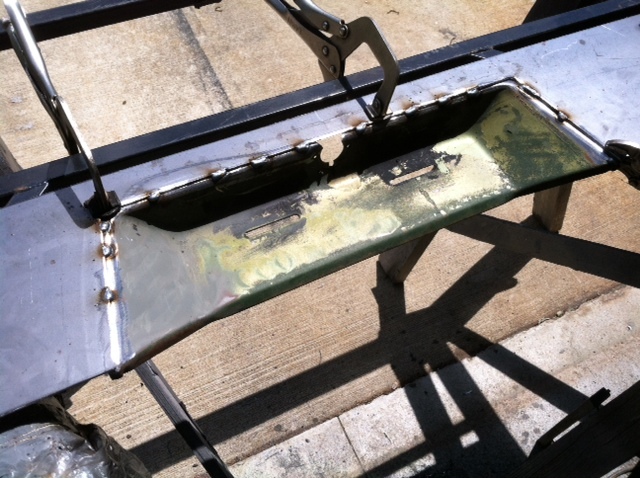 I fabricated the top and side pieces of the roll pan and welded them in place. At first I wanted to design it so the roll pan could be removed, and I didn’t want any bolts to show when it was installed, so I fabricated some brackets that would bolt to the frame and welded them on the back of the roll pan. I clamped the roll pan down to the work bench with a piece of pipe under it so I could heat the metal and shape it to the curve of the pipe. It wasn’t perfect, but it worked. 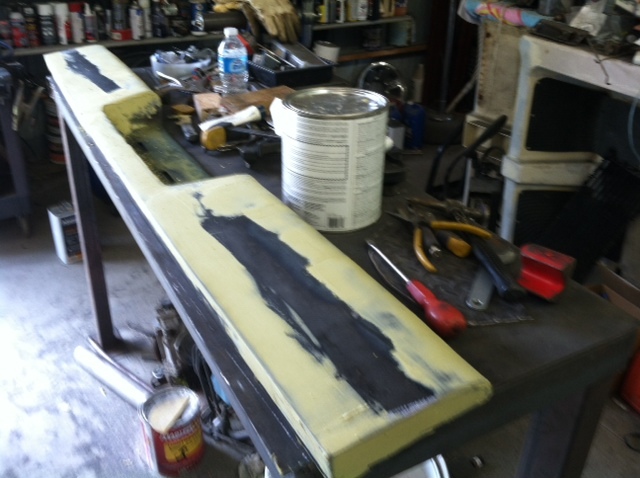 I ground all of the welds down smooth and used some Bondo to clean up the edges. The only thing left to do is figure out if I want to install any flush-mounted lights in the roll pan our leave it smooth. Then I can prime and paint it to match the front bumper. 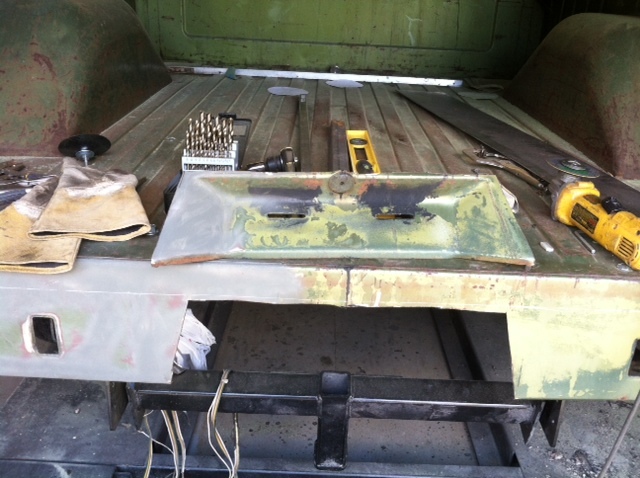 At the last minute I decided to weld the roll pan in place and do the body work to get a nice clean finished look. 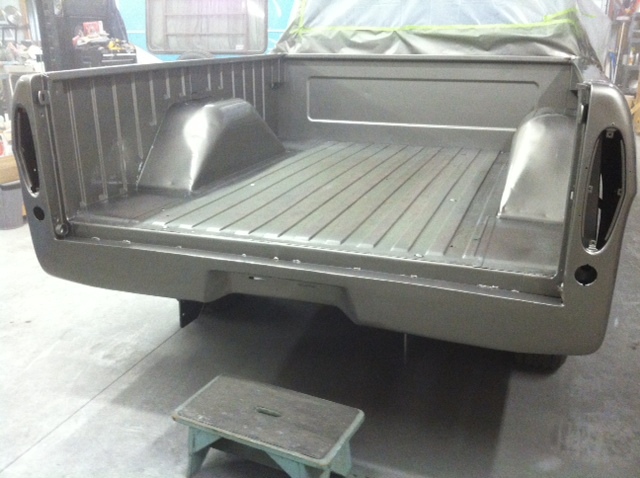 I finished the roll pan, sanded the bed and tailgate and sprayed them. This is how the roll pan turned out. Now I can move on to the custom exhaust system.